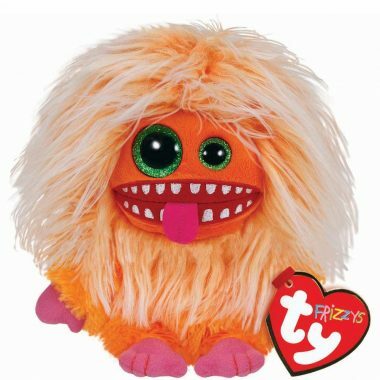 Plopsy is made from a fuzzy bright orange material with longer, lighter orange fur on his head. He has large, odd sized, sparkly green and black button eyes and a large red mouth with a row of white teeth and a pink tongue poking out from his mouth. His hands and feet are made from pink material. but don’t you try to run. and we’ll have lots of fun. Plopsy was released on 1st July 2014. He is one of the original six Ty Frizzys released. This is the larger 9″ version of Plopsy. He was also released in a regular 6″ size and as a key clip.